As was made evident by the Giancarlo Stanton extension, the Marlins are trying to build up to win. On Wednesday, they added Dee Gordon, a player who has been good in one year. On Thursday, they added Mat Latos, a player who has been good in several. There’s another difference, though — in 2014, Gordon was at his best. Latos, meanwhile, missed half the season due to a variety of injuries. The Marlins are betting on him to be successful in his last year of team control before free agency. To Cincinnati go Chad Wallach and Anthony DeSclafani. Latos is a player of particular interest. Previously in his career, he was moved from San Diego in a blockbuster. Twice, he’s hit 4 WAR, and two other times, he’s come in around 3 WAR. He’s now coming off a half season in which he was worth 1.5 WAR. In a full season in 2015, Steamer projects Latos to be worth 1.2 WAR. It’s a surprisingly pessimistic figure, for a pitcher who just turned 27, so it’s worth explaining why Steamer thinks the way it thinks. Why is Steamer so down on a front-of-the-rotation starter? For whatever it’s worth, that chart excludes intentional walks from the calculations. It doesn’t make much of a difference. League-wide, it’s understood that strikeouts are on the rise, and walks have been very slowly slipping. 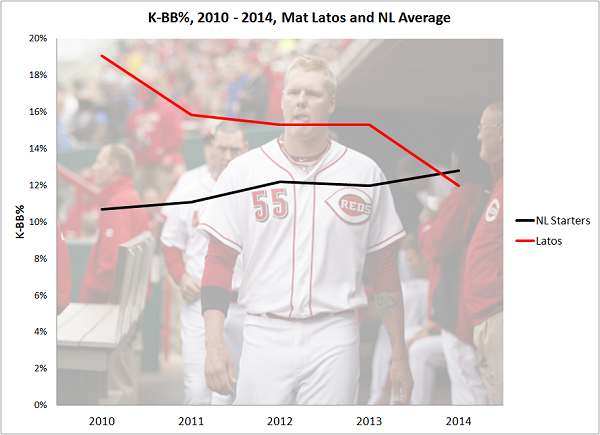 Latos has gone the other way, and last year, for the first time, his K-BB% was a little worse than average. That’s not a good thing. That’s never a good thing. There’s no such thing as a good reason to want to have fewer strikeouts, relative to your walks. It’s not exactly subtle. According to our own data, between 2013 and 2014, Latos’ average fastball lost 1.9 ticks. Only six starters had a bigger drop, and Latos didn’t in any way get stronger as the season wore on. Martin Perez had a bigger drop, and he wound up in need of surgery. Justin Masterson had a bigger drop, as he was dealing with knee problems. CC Sabathia had a bigger drop. Generally speaking, these things are related to less-than-optimal health, and less-than-optimal health isn’t an encouraging thing for a pitcher to be dealing with. Mat Latos (elbow, knee, calf). There was a lot going on, some of it simultaneous. Again, Latos missed half the season, and within the last couple months Latos had surgery on his elbow to try to regrow tissue. It was a stem-cell operation, not a ligament replacement, but Latos is a pitcher who just had his arm opened up. Related to all of this, Latos’ velocity dropped substantially. And Steamer folds that information in. Steamer doesn’t simply look at Latos’ numbers and come up with a projection. Steamer also has a velocity factor, and so it shudders at what it observes in Latos’ profile. Historically, losing one mile per hour has meant more runs. So, historically, losing two miles per hour has meant even more runs. Though Latos’ ERA was fine, his xFIP was worse than the average, and when Steamer considers what happened with the velocity it assumes worse days are coming. There’s a steep penalty for suddenly not throwing as hard. This is where we run into trouble. 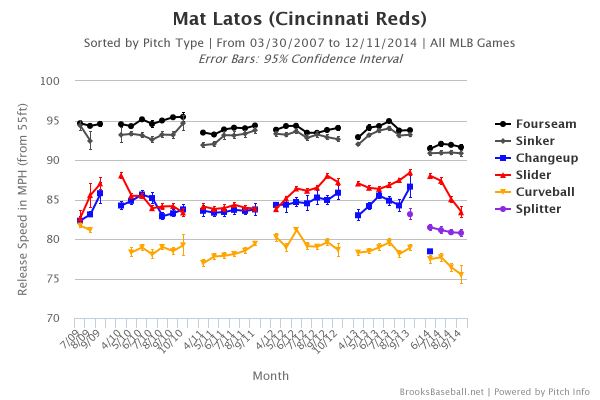 Objectively, Latos’ 2014 doesn’t bode well. Not that we can ever 100% believe in the projections at the healthiest of times, but when injuries are involved, it becomes that much harder to know what the future will hold. The Marlins seem to have confidence that Latos will bounce back. They believe that because Latos has all offseason to recover. Yet Latos is a pitcher coming off a year in which he struggled with several parts of his body. His velocity went down a couple miles per hour, and it never improved. Latos is projected to make more than $8 million in the coming year, so this isn’t the cheapest of gambles. If Latos makes 25 – 30 starts, the upside is obvious if he can get back any of his strength. The Marlins aren’t paying for this steeply, and they could be on the verge of contention, and if Latos is good enough the Marlins can follow the year with a qualifying offer. Yet if Latos hardly pitches, or if he hardly pitches well, the Marlins can’t claim it was impossible to see coming. This is a very volatile asset, and for the right to have him for a year, the Marlins are giving up a half-decent catching prospect and a big-league-ready fourth or fifth starter. Chad Wallach just had more walks than strikeouts. Anthony DeSclafani is a strike-thrower, and he’s projected for a 4.18 FIP. Latos is projected for a 4.34 FIP. In other words, Steamer thinks the Marlins traded a better pitcher than Mat Latos for Mat Latos. There are reasons to think those projections are absurd, but all Steamer knows is what actually happened. It’s an understandable trade for the Marlins. The risk is all theirs. Now the Reds have some longer-term assets, and they no longer have to worry about Mat Latos. There are worse outcomes. We hoped you liked reading Why Steamer Doesn’t Like Mat Latos by Jeff Sullivan! Wouldn’t Mat Latos’ team get a comp 1st round pick when he hits FA? Are the two prospects the Reds got back worth more than a late 1st rounder/early 2nd rounder and a season of Latos? Obviously this is a salary dump per all the rumors of the Reds way over budget but I don’t think the Reds got the best of this trade when you figure in the likely comp pick. They only get a comp pick if he has a good enough year to warrant giving him a Qualifying Offer and he elects not to take it, and then signs with another team before the June draft. That’s a great point. Though, as Nathaniel said, he may not be good enough for a QO. But there hasn’t yet been a FA that rejected the QO so why not? With exception of players in steep decline (ex: Rickie Weeks) most teams offer the QO. Lots of players have rejected the QO.